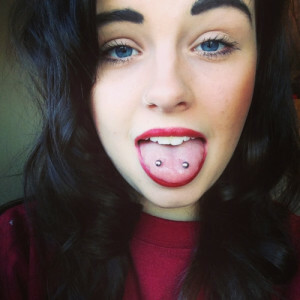 It is a pair of piercings done horizontally closer to the tip of the tongue. Since this unconventional tongue piercing resembles the fangs of a snake from where the venom is released, it is called venom piercing. Double tongue piercing, frog eyes piercing, and venom bites piercing are its other names. 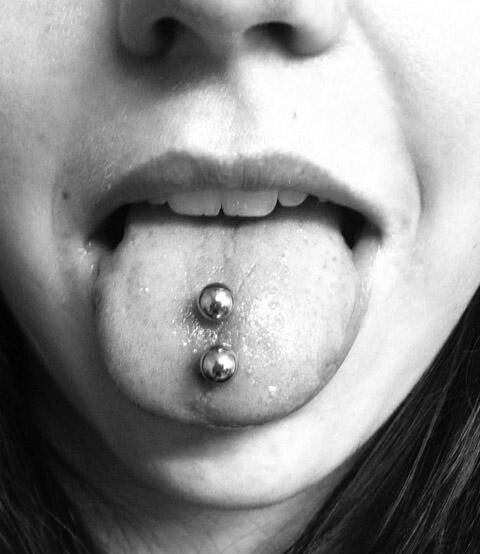 Vertical venom piercing involves two piercings placed vertically on the tongue. Make sure you visit a piercing salon that is well-versed in oral piercings. Discuss properly with the piercing professional regarding the exact placement of the piercings to maintain sufficient gap between the two perforations. After you have completed rinsing your mouth with an antibacterial solution, a sterilized, hollow needle is passed through the tongue. Once the piercings are made, the jewelry is inserted into the tongue. 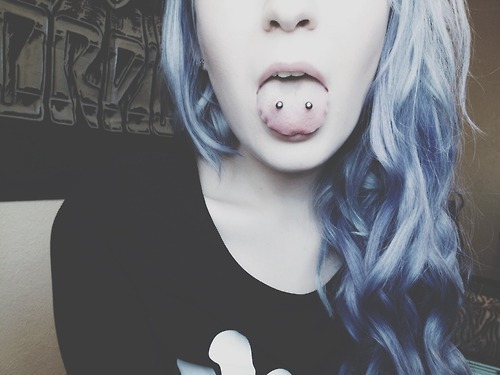 A double pierced tongue might hurt more than a regular tongue piercing. People with a low pain threshold would give it 8 or 9 on a pain scale of 1-10. In the initial days, the tongue will swell causing soreness and bruising for a couple of weeks. However, having this discomfort after a piercing is normal which goes away after a while. The healing period is 4 to 8 weeks for this piercing. Painful swelling of the tongue accompanied by redness and pus discharge clearly indicates an infection. If you are unable to bear the pain then visiting a doctor is advisable as the infection might further lead to more complications. Although taking care of double tongue piercings is difficult due to their odd location, maintaining good oral hygiene may prevent the growth of infection-causing bacteria. Piercing the delicate tongue involves the risk of permanent nerve damage that causes speech impairment and numbness. For this reason, a highly-skilled piercing artist must be appointed to carry out the process safely. Make sure the jewelry is not loose before you go to bed, as there is a higher possibility of swallowing or inhaling it while sleeping. Regular contact with the jewelry can lead to chipping and cracking of the teeth along the gum line. In some cases, use of inappropriate jewelry causes an allergic reaction that leads to rejection and migration. Get it removed to avoid scarring of the tongue. Straight barbells are used for venom piercings. Most professional piercers insert longer jewelry to facilitate normal healing. Shorter bars measuring between 2 mm and 4 mm can be replaced with the barbells after the tongue heals. In most well-known piercing salons, the price of the piercing varies between $30 and $100 for it.